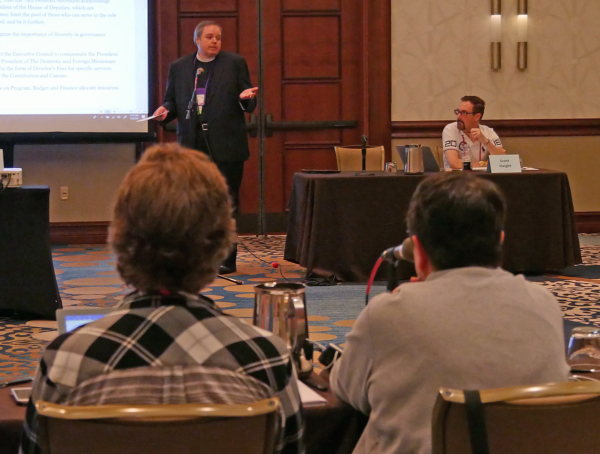 Legislative Committee 16 – Churchwide Leadership spent three hours discussing three resolutions each proposing a different way to compensate the deputies’ president. The committee members also heard from five witnesses as well as Episcopal Church Chief Legal Officer Doug Anning before making their decision. “We’ve taken historic action,” Diocese of Maryland Assistant Bishop Chilton Knudsen, chair of the House of Bishops’ Committee 16, told the committee after its unanimous vote to recommend Resolution B014 for adoption. Each house has the same legislative committees and they regularly meet together to hear testimony and debate resolutions. Bishop and deputy members voted separately. The issue of compensating the president has been discussed for decades. General Convention considered the salary issue in 1997, 2000 and 2015. Each time, the deputies were clear that they wanted to see their president compensated. The question of a salary for the House of Deputies president prompted a rare conference committee between bishops and deputies in the waning hours of the last convention. 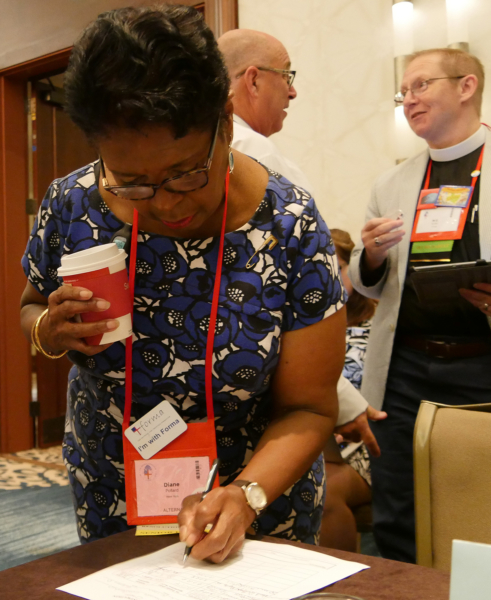 The 2015 meeting of convention eventually agreed to postpone making a decision, instead calling for the presiding bishop and the president of the House of Deputies to appoint a task force to study the issue. In addition to chairing the House of Deputies during convention, the president also is canonically required to serve as vice chair of Executive Council and vice president of the Domestic and Foreign Missionary Society, or DFMS, the nonprofit corporate entity through which the Episcopal Church owns property and does business. He or she has a wide swath of appointment powers. The president also travels around the church, speaking at conferences and other gatherings, meeting with deputies and other Episcopalians. The position, which is filled by election during each meeting of convention, has a travel budget and a paid assistant. Each president is limited to three consecutive terms. Supporters say making the office a paid job in some way would broaden the pool of people able to consider running for election. The task force said that only people who are older and/or have what it called favorable “personal economic circumstances” can realistically hold the office. Thus, presidents are not always chosen based solely on gifts and skills, the members said. Diocese of Southern Ohio Bishop Tom Breidenthal is the other B014 endorser. Others disagree with any proposal to pay the deputies president, some saying they fear “mission creep” and those polity implications in the form of an expansion of the president’s duties and authority. Some cite Resolution A099 proposed to this convention that would allow the president to call a meeting of the House of Deputies at times other than the triennial gathering of convention. Runnels also suggested that not all of the work that recent presidents have taken on is mandated by the constitution and could be delegated to others. The presidents “increased the burden of the position” by choosing to take on that work, he said. The Task Force to Study Church Leadership and Compensation, called for by the 78th General Convention, concluded in its report to this meeting of convention that the work of the House of Deputies president amounts to a full-time job. Its Resolution A028 calls for a salary but does not set an amount. Runnels was specifically testifying against that resolution. He was one of five people who testified, and the only one who opposed either A028 or B014. The task force asked Executive Council to include a proposed salary in the draft 2019-2021 budget, which it gave to the Joint Standing Committee on Program, Budget and Finance (PB&F) in January. The task force did not suggest an amount, but it included $900,000 for a full-time salary and benefits for the three years in the draft budget (line 557 here). Resolution C042, from Province IV, proposes a different approach to the salary issue. It would have Executive Council set what it calls per diem compensation for the president when she or he is at council meetings, consults with the presiding bishop in making appointments required by canon, and is doing official work related to General Convention. Calling it a way to address the “short-term fairness issue of compensating the president,” the resolution also proposes that a special task force “clarify and enumerate the comprehensive role” of the president. Rowe had proposed B014 last week to direct the Executive Council to pay the president director’s fees as a possible compromise between the other two resolutions. During debate on July 4, the committee amended the resolutions to fully describe the fees as both director’s and officer’s fees. The amendment, Rowe said in proposing it, ensures that the resolution “conforms with New York State law and allows us to expand the range of motion that Executive Council can have and, again, it has no effect on polity,” he said.